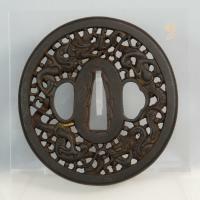 Very thick, well carved Namban with dragons in high relief extending beyond the width of the rim and deeply carved. Nice iron of higher quality than most typical Namban. Treatment of seppa-dai and kozuka/kogai openings is not in the typical Namban style. Double dragons in the clouds are a traditional Chinese motif for good fortune and prosperity.